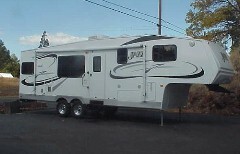 Northern California RV Best Choice! This model 3070 mid height, mid range fifth wheel has several significant additions to it's Model 2870 twin: The 60" X 80" queen bed now sits on a slide with windows on both sides. There's a full width vanity at the foot with a TV cabinet and it's own window above as well. A mirrored wardrobe extends across the front. Then the adjacent walk through bath has a large corner shower plus an enclosed room with deluxe window and blind for the pedal operated china toilet. From here it's just two gentle steps down into the center living area revealing the unique "J" lounge accross from the slide mounted sofa bed. 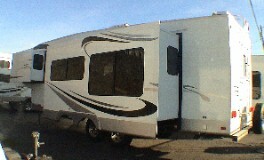 The built in Home Entertainment Center is visible from the large galley which extends the full 102" width of the rear. The slide mounted dinette completes this apartment style very livable plan. QUALITY... COMFORT... PIZAZZ... That's JAZZ!